A New York Times review sparked fury for critiquing Mark Twain's racial politics. 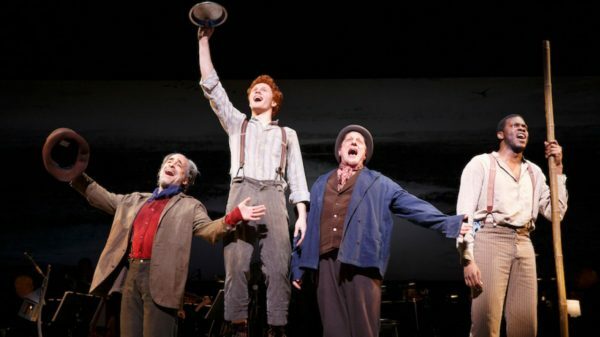 Here, Nicole Serratore steps into the critical dispute over Big River and representation in theatre. New York theater criticism is having a week. Where is my fainting chair and good strong drink? It’s been a while since we had a bona fide criticism kerfuffle but I wish this one did not exist. The dispute that arose this week somehow queries whether contextual criticism is “serious” criticism. I can’t quite believe I have to defend the merits of theater criticism which responds to the work’s place in our time. In this battle royale, on one side we have Laura Collins-Hughes. She is one of the New York Times’ regular freelancers and she wrote a review of the Encores! production of Big River—a musical from 1985 based on The Adventures of Huckleberry Finn by Mark Twain. On the other side is the Encores! artistic director, Jack Viertel. Now, we’re all acutely aware in New York that the material Encores! puts on is not of this era—that’s in fact their remit. Encores! “celebrate[s] rarely heard works” from the American musical theater and gives them a concert-style production with an orchestra. Every once in a while, these older shows find a new audience and a commercial transfer happens. But Encores! is also the place where I saw a musical that involved a polygamist Mormon man selling one of his wives for laughs. They often deal with ideas, works, and issues that are dated, questionable, or as the kids say, problematic. Her mild questioning of the cultural value of Big River today would likely have escaped most notice until former New York Times theater critic Frank Rich went so far as to tweet that her review was “p.c. policing” that “empowers Trumpists.” Rich then went on to publicly post a letter sent by the artistic director of Encores!, Jack Viertel, to the New York Times challenging the review. His attack appears isolated to Collins-Hughes. He takes no issue, that we know of, with Jesse Green writing in New York Magazine with even more force about the uselessness of a Big River revival. The Times thankfully responded to Viertel’s letter, defending Collins-Hughes’s work. Of the 10,000 disheartening aspects of Viertel’s letter I was mostly troubled by the arrogance to suggest that addressing whiteness on stage and its over-sized place in the American theater is unwelcome or unnecessary (hashtag white men so fragile). To take umbrage that a contextual review about race in America with a musical that deals in race in America is policing, overreaching, or not a part of serious criticism is stunning. We need to talk about this. We do not talk about it enough. By avoiding conversations about race, we deny the reality around us and that is disingenuous. Reviews at the Times have not always addressed or foregrounded these issues. With the sudden departure of New York Times critic Charles Isherwood last week, the paper of record posted a job listing for his replacement. What was remarkable about this—both in form and style—is that they were making an open national search and the inclusive nature of the job description. It calls for a critic who will “connect the themes and issues on stage to those of the wider world.” Moreover, the position calls for someone “curious, discerning, open-minded and energetic about seeking out emerging voices and talents.” It felt like the Times was actively seeking to move theater criticism forward in a direction not unlike that of Collins-Hughes’s review. For that to be followed by Viertel’s heavy-handed rebuke certainly created a stir. There is no question there are others who support Viertel’s view (read the comments on the Collins-Hughes review or the comments to Rich’s Facebook post). And maybe that is an even greater concern. We are a divided nation in a lot of things these days (even a theater flap ends up with a Trump reference). But the effort to shut down this kind of discourse or to discourage criticism that focuses on representation is not isolated to this show or this instance. We continue to have semi-regular fights over yellowface and The Mikado. There are staunch defenders of Gilbert and Sullivan demanding the “PC police” take their hands off their classic (and see no problem with the yellowface) and a growing vocal opposition led by Asian-American artists saying enough is enough and yellowface must cease. Many of these pro-classic advocates are asking for these works to be placed in amber for pristine preservation. What kind of theater do we expect to have if we never acknowledge where we are standing when we see these revivals? There is also something more nefarious in what this attitude perpetuates. A preservation of the status quo is actively damaging. As a mild example of this, I’ve sat through three shows over the past two months where a female character is injured or abused (physically or emotionally) by a male character and in the end of the story she returns to this man. In each of these stories I rationally know the female character is not central to the narrative (and to be clear not all were written by men or Americans). But I left each time wondering what she was thinking, particularly because of her actions. Naturally, the plays did not say. They were not about her. After seeing this three times in short order, I felt exhausted by the female characters’ marginalization. The excuse I was giving to each writer, “well it’s not her story” felt flimsier with each show. Of course, it’s not the job of every playwright to write every story from all angles forever. But my excusing it, even briefly to myself, is the critical issue. It denies the existence of a larger problem by narrowly focusing my lens. It was only three plays and I’m a privileged white woman. Imagine a lifetime of this kind of marginalization and casual dismissal with excuses by the thousands which chip away at reasonable concerns raised (It’s satire. It was written a long time ago. You misunderstand the nature of Twain. Gilbert & Sullivan were not writing about Japan. You’re failing to respect the world he was writing in. It’s just a musical. So what if it’s about white characters. Why does everything have to be about race? Why are you bringing your 2017 attitude where it does not belong?). The health of the theater depends on someone talking about what we put on the stage and how it reflects back on the moment we are in. As critics, we have an obligation to observe and report on what we see. 100 different people will react 100 different ways to Big River. You can disagree with Collins-Hughes’s opinions. You can argue her writing was not clear. You can prefer another review which more aligns with your experience. You can burrow down inside your cozy love of Mark Twain, crank up your Gilbert and Sullivan on vinyl, and never read another theater review again. But you should not be advocating snuffing out a critical conversation that needs to take place even if you don’t see yourself as the beneficiary of that conversation. How are those opinions less “serious” just because they are not central to your world view? Just because you don’t feel marginalized does not mean it’s not happening. There is a hungry audience for this perspective in theater criticism who have long been starved of it. Let us be fed. See Lane Williamson’s review of Big River for Exeunt.